What the Romans in Britain lacked in aesthetics they more than made up for in efficiency – and a Stanford researcher shows how they did it by recreating and firing a kiln based on the late Iron Age and Roman models in Britain. "We've been burning for an hour and a half, and we're up to 50 degrees Celsius," Chatfield said early Friday afternoon. "We're heading up to just below boiling." Chatfield is a veteran of such replication efforts. In November 2009, she spearheaded an effort to recreate 16th-century Incan pottery. Last year saw replication projects for the ceramics of Neolithic Turkey and the pottery of the Pueblo and Anasazi. The weekend project is linked with Stanford's archaeological endeavor in Binchester, England, at the first century Roman fort called Vinovium. It is one of the richest archaeological landscapes in the world. Melissa Chatfield - The fire in the kiln burned for 19.5 hours, ending in the early hours of Saturday morning. Since 2007, Stanford has been in a partnershipwith Durham University to excavate the fort and Binchester, with its rich archaeological record going back to the Iron Age. Pottery shards are among the finds. "We learn loads from observing how clays respond to heat, things that modern ceramics studies has bypassed on its way to high-fired materials," Chatfield said. The efforts tell us much about the nexus of geology and technology. "What we've learned from the suite of replication events on campus is that the firing technologies evolved to fit the materials," Chatfield said. The effort also helps trace the influence and intermingling of cultures, "such as European and indigenous encounters in Peru or the Romans entering Iron Age Britain," she said. Even before Emperor Claudius' invasion of Britain in A.D. 43, pottery was Britain's most imported item, even ahead of food. Britain's own pots were dun-colored, with an emphasis on heavy jugs, unlike the more refined and decorated terra cotta Samian ware imported from Gaul. So why were the English pots so utilitarian? Were they cheaper to make this way? Was it easier to import the fancy stuff than create it? Was this the best that could be done in local conditions? Or did the soldiers simply not bother with aesthetics? These are the questions Chatfield is hoping to explore with more replications. 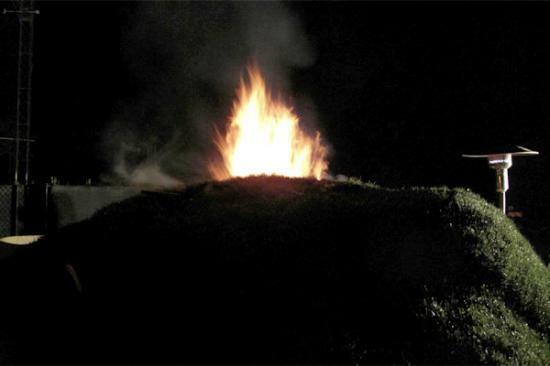 All the previous endeavors were open-pit firings, which can be set up anywhere. 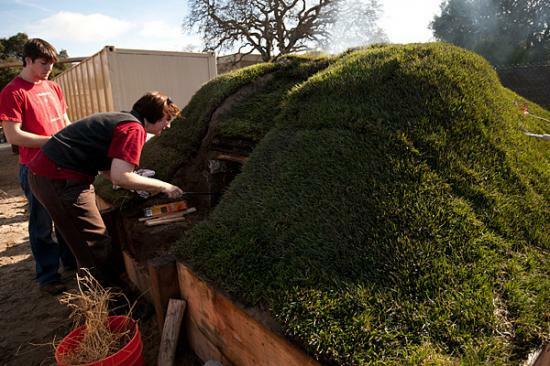 The grass-covered mounds allowed for a much more industrial-scale yield of the roof tiles, bricks, storage jars and kitchenware the Romans needed for everyday life. The pots in the Stanford firing were a cut above their first-century forebears: some of them wheel-thrown and others built by hand, crafted by nearby Foothill College students and local high school students, as well as by members of the Stanford community. But unlike the Incan pots of 2009, they were undecorated and unglazed. 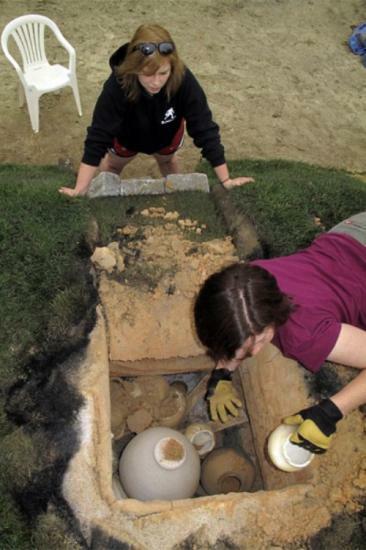 Jim Young - Melissa Chatfield removes the fired pottery from the kiln as student Kate Rose looks on. The weekend firing offered a few other changes: While making the kiln was a lot more work and used a lot more fuel (wood, rather than the alpaca dung used in the Incan project), temperatures could be controlled more efficiently because the closed kiln was protected from the wind. With this type of kiln, craft production could be organized more effectively and could also be supervised by one person – the fire won't rage out of control, endangering the community, and people don't have to rush in to revive a flagging fire that jeopardizes an even baking. The Romans were efficient, if not artistic. On this wet, chilly Friday, the climatic conditions, too, seemed to replicate northern England. "There's not really a dry season there; even in the summer it can be quite cold," Chatfield said. By dusk, the smoke played across the grass, a swirling mystical effect of heat and moisture. But Chatfield was not lost in the romance of the phenomenon – she was busy poking the orange fire with a stick. She and her colleagues were waiting for the sounds of the distinctive crash or pops that signal failure – that pots have cracked, fallen or exploded in the heat of the kiln. "If this is somehow un-Roman or not part of the process, let me know," Jim Young, a community volunteer, told Chatfield. He was feeding yellowed local grass into the fire. The trick was not to get burned. "I imagine Iron Age Britons just had really tough hands," he said. For the others, there was little to do but watch and admire. About 70 people filtered through the Stanford Community Farm building between noon and midnight during the firing. It wasn't over until 7:30 the next morning, after burning for nearly 20 hours. "We came back on Sunday to open it up and pull out the pots. None of the pots died, although some of them warped a little from the intense heat," said Chatfield. There are more attractions to come; the labor-intensive kiln will have a second firing this spring. This summer Chatfield and her colleagues will build a similar kiln at Binchester, using local materials, that will be accessible to a wider public.